If you like waking up to a new deal every morning, then That Daily Deal is sure to put a smile on your face. Especially since they feature 5 unique deals every day: a main deal which features a random item, a daily shirt deal, a daily pet deal, a daily style deal and a "meatball's pick deal" which is a random deal that is picked by their Mascot "Meatball". Now if those deals aren't enough to brighten up your morning, you may also want to check out Jammin' Butter's other sites 13 Deals and LocoBuy. 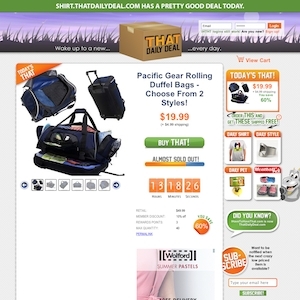 Thatdailydeal.com currently ranks #100 amongst sites offering online deals -- DeepDiscount ranks #99. In the General Merchandise category, That Daily Deal ranks at #34 -- PulseTV ranks #33. Amongst all deal a day sites, That Daily Deal ranks #16 -- SharkStores ranks #15.